An easy guide to roofing and waterproofing codes and their interpretations. 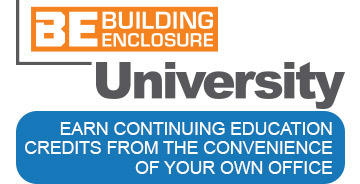 Hear from editors and industry leaders on the topics that matter the most regarding architecture practices, building codes and details for the building envelope. A description and break down of the most recent additions and changes in roofing and waterproofing codes. The latest news on architecture practices, building codes and details for the building envelope. Building exterior including roofing and waterproofing systems as well as wall systems, cladding, windows, and foundations. For each course, attendees must read each article in its entirety and take the 10-question quiz at the end of each article or online at continuingeducation.bnpmedia.com. For those who pass the quiz with a score of 80 percent, a certification of completion will be available for immediate download. EIFS, stucco, and other finishing systems. Highlights news, products, case studies and project profiles specific to green roofing. Commercial, industrial and residential systems including single-ply membranes, built-up roofs, modified bitumen, spray polyurethane foam, vegetative systems and roof coatings. Architectural metal panel roof systems, structural metal panel roof assemblies, and cladding, as well as related components such as flashing, trim, gutters, downspouts and scuppers. Residential and commercial roofing systems including asphalt shingles, synthetic shingles, metal systems, slate, wood shake, and clay and concrete tile and related components. Compilation of new and notable products, materials and innovations available to the architectural roofing and waterproofing industry. Case studies focusing on specific waterproofing and roofing applications for architectural-specific projects. The structural component of the building that serves as the substrate of the roof. Deck types include steel, concrete, wood plank, wood panel, lightweight insulating concrete and cementitious wood-fiber panels. Materials whose primary purposes is to provide thermal resistance, such as polyisocyanurate, expanded polystyrene (EPS), extruded polystyrene (XPS), cellular glass, mineral fiber and gypsum board. Keep up to date on information from trade shows. Systems that minimize the burden on the environment conserve energy and extend the life span of the structure. Projects with exemplary building enclosure systems, including ICFs, insulated metal panels, and other methods. Materials applied to building surfaces to prevent the infiltration of water, including liquid-applied, membrane, and bentonite clay systems.